We are now writing the introductory chapter in TechAmerica’s research examining the nexus of social, mobile, analytics, and cloud. CSC is hosting a #SpeedIdeation event with an open discussion on the changing role of government, the meaning of national security, and our entire approach to intelligence collection and law enforcement. Join the co-creation Monday (9/29/14). Your comments will help shape the research and we will, of course, acknowledge your contribution in the final report. This coming week we’ll start one hour earlier. Soren and Thomas will lead a discussion on public WiFi for business purposes as discussed on Twitter. The two main hosts will publish more information soon. Looking forward to global creativity again. Das Interface ICameraTracker ist nun an den Renderer angebunden und eine statische Klasse implementiert, welche das bisherige, starre Geradeausschauen abbildet. Dabei ist mir aufgefallen, dass letzterer für die Kamera leider keine Winkelausrichtung unterstützt, sondern nur ein “looking target”. Die Idee dabei ist, dass die Kamera sozusagen an Position (0,0,0) gelegt wird und ein virtuelles Objekt existiert, welches irgendwo im Raum positioniert wird. Die Kamera wird dann angewiesen, auf dieses Objekt zu zielen. Der Einfachheit halber ist es sinnvoll, hierfür einen begrenzten Raum von (-1,-1,-1) bis (1,1,1) aufzuspannen, in dem das Objekt positioniert wird. Der Vorteil hierbei ist, dass die Blickrichtung im Gegensatz zu Eulerschen Winkeln (wo es von der Ausführungsreihenfolge abhängt) eindeutig ist. @Anton: Ich könnte jetzt die Winkelangaben umrechnen, nehme aber an, dass es effizienter ist, wenn das bereits auf Deiner Seite passiert. Ich habe daher das Interface in diesem Parameter angepasst. Die Details Deiner bisherigen Berechnungen habe ich leider nicht durchdrungen, vielleicht kannst Du es soweit optimieren, so dass Du direkt die Raumkoordinaten ermittelst statt der Winkel? After some days of vacation and business travel we’re now preparing the next session. In the meantime we did get some traction in the project(s) started and also received additional ideas. – Please tag all your posts with “DBAR” to ensure they’re listed on the project page. In less than one hour @JerryAOverton will answer questions to the paper published last week. 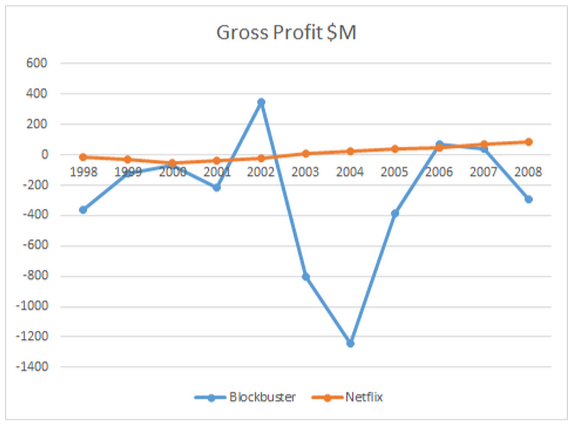 We’ve created a new method of business model simulation and used it to simulate the market disruption of Blockbuster by Netflix. The method was useful in simulating real innovation, it made predictions matched observations, it produced real insight, and was easy to build using R.
Thanks again to everybody who helped prepare, run and of course to all of those who joined in and volunteered to “get stuff done”. We’ll open the projects we decided upon within the next 24 hours.